EFIC supports any program that contributes to a healthier lifestyle, especially in regards to physical activity, that we encourage through our On The Move Campaign. Besides, we are active on the Health Policy Platform thanks to our stakeholders group. 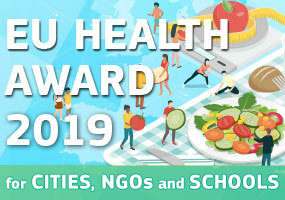 On 1 April 2019, the European Commission launched the 2019 EU Health Award for cities, NGOs and schools. This year, its aims to reward initiatives seeking to prevent and reduce obesity in children and young people (6-18 years). In 2015, around 1 in 3 children in the EU aged 6-9 years old was overweight. Especially alarming is the fact that physical activity tends to drop between the ages 11 to 15 in most European countries. The role of cities, NGOs and schools is crucial in the effort to prevent and reduce obesity in children and young people. Interested parties are invited to check the eligibility criteria and present details of their initiative by 13 May 2019 at 11.00 (morning) CET, Brussels time, using the online form. Initiatives could include, for example, actions creating awareness raising campaigns, preventing overweight with the support of mobile health (mHealth), engaging with health care professionals through training, among others. The three winners will be announced in October 2019 at an event in Brussels. The shortlisted initiatives (cities, NGOs and schools) will be invited to attend.